Handcrafted and hand stamped stethoscope ID is designed for you to identify your personal stethoscope with the sophistication of the medical professional you are. No more losing or mixing up your device with countless others working beside you. 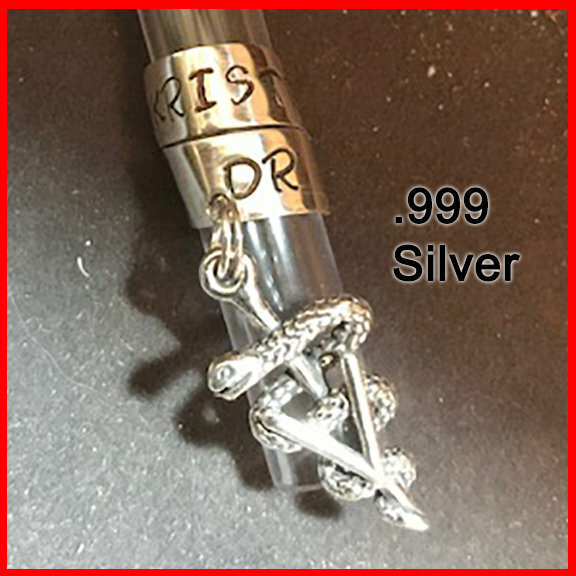 **** Our ID rings are the real thing made with .999 Fine Silver and because of that our letters are darkened with oxidation that will never wash off (we guarantee it!!!! ), unlike the common Aluminum products on the market! Our Stethoscope ID's are easy for you to adjust to your size stethoscope, simply remove the bell, slide on your ID ring and squeeze it tight, then simply replace the bell. Please provide the name and credentials you want on the ID tag! Because this item is custom stamped with your name and credentials it is non-refundable unless damaged in shipping.